It was a constant throughout Charlie and Karen Egedy’s careers, in engineering and education, and in their retirement, when they each began a second career, this time he in education and she in engineering. 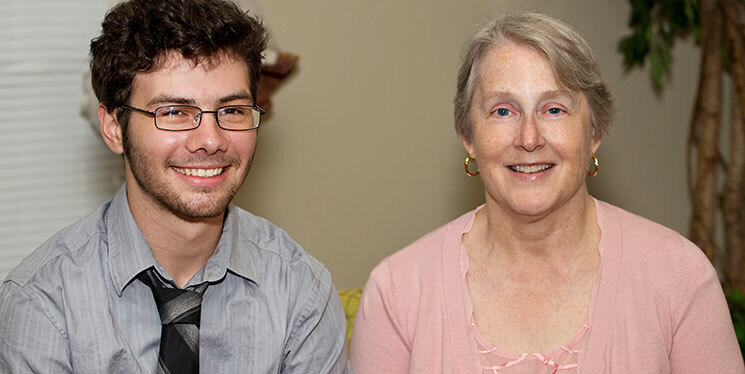 And math was a constant this year when, after Charlie passed away, mathematics freshman Nathaniel Martin became the first scholarship recipient of the Charles R. Egedy, Jr. Science Residential College Enhancement Fund, established by Karen in Charlie’s memory. Martin, who graduated from his high school in Covington, La., in just three years, said mathematics has been his favorite subject throughout school. Charlie earned a PhD in mathematics from LSU, where he taught mathematics courses in the Science Residential College after retiring from a career in engineering. Karen said that Charlie always put teaching first, showing his devotion to his students by mentoring many of them. The Science Residential College, housed in Evangeline Hall, opened in 2009 to help first-year students in the College of Science adjust to the rigors of college courses while making friends and getting to know faculty in a small college living-learning environment. The scholarship, funded by generous donations by family and friends, will pay for the costs of the program.